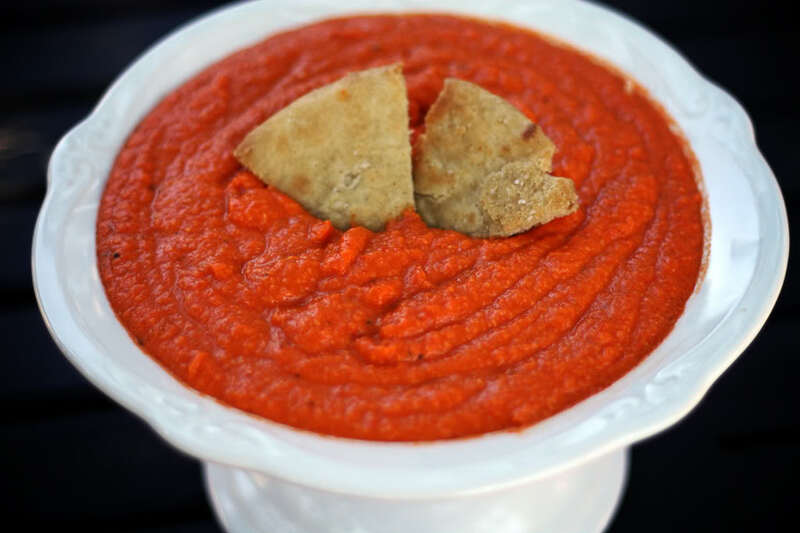 This easy roasted red pepper hummus is a twist on the classic version by adding fire roasted sweet red peppers to the traditional chickpeas, tahini, garlic, lemon juice, cumin and olive oil. It’s so simple to make and comes together in a flash! Hummus is a traditional Middle Eastern bean dip that goes great as a dip for fresh vegetables or pita bread. My favorite way to eat it is with toasted pita triangles. I just buy premade pita bread and cut it into wedges and spread the wedges out on a baking sheet. Drizzle very lightly with olive oil or olive oil cooking spray and toast them lightly under the broiler. I turn them and toast the other sides. I like them a little crisp on the outside and chewy on the inside. This is a great starter for a dinner party or served as an appetizer. If you want regular hummus, just omit the roasted red peppers. Put everything in a food processor and begin to process; add chickpea liquid or water until you reach a smooth puree. Serve drizzled with additional olive oil.